Australia has an enviable reputation for legal professionalism. We are able to rely on our legal system, our judges and our courts to provide a fair process and a reasoned and just decision, when seeking the resolution of a conflict. However, Australian governments and courts, both state and federal, are increasing relying on ADR (Alternative Dispute Resolution) methods like mediation, conciliation, expert determination and arbitration to assist with the resolution of the expanding number and increasing complexity of matters, vying for court time. ADR processes are highly effective in dealing with all manner of disputes, particularly those involving complex factual situations, technical issues requiring expert evidence or emotionally charged disputes.In considering the best way forward for the resolution of your dispute, why not start with a process that will lead quickly to the result, rather than get there by a costly and circuitous route? But our legal system is based on an adversarial model that we have inherited from ancient times. The adversarial process requires each party to promote their own position, at the expense of the other sides. Having two combatants meet to argue and fight to determine an outcome is a continuing part of our history and culture. But just like warfare, where two opposing armies meeting to determine an outcome, it is out of vogue with both the efficacy and efficiency of finding a resolution in todays context of a shared humanity. Litigation and judicial determination by a court is an increasingly unwieldy and expensive solution. 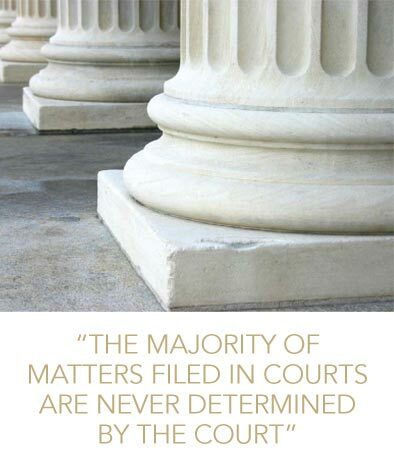 The vast majority of matters filed in courts, never in fact reach a final determination. Instead they are settled out of court by negotiation, agreement or abandoned because of the costs, difficulty and the time it takes (involving lengthy delays for procedural processes). Plus the decision of the court “of first instance” is not final. Our rules allow for a matter to be appealed to the court with final jurisdiction, which in most cases is the High Court. Each step, along this process necessarily involves further cost and time delays. By comparison, ADR processes have developed around a collaborative model. This recognises that although parties may be opposed in regard to the issues in the dispute, they may have other issues in common, such as the desire to get a “just, cheap and quick” resolution of their dispute.